How did Morrissey follow the incomparable Vauxhall & I? This masterpiece, gentle, lyrical and, with its climactic ending, forming what could have been a full stop in fact turned out to be a series of ellipses, and a pause. The silence was shattered remarkably quickly. First by Boxers, following on lyrically and musically from Vauxhall. Morrissey fans down the front at his concerts have never struck me as the wallflowers they’re painted as, and never seemed to have too much trouble identifying with laddish anti-heroes found in his songs, and the unfortunate pugilist ‘losing in front of your home crowd’ who wishes ‘the ground will open up and take you down’ fitted right in to the cast of characters we meet in Vauxhall like Spring-Heeled Jim and Billy Budd. It was not a stretch to imagine Morrissey enraptured by a night down the front at York Hall. This Morrissey then let rip with another album to echo down the decades. 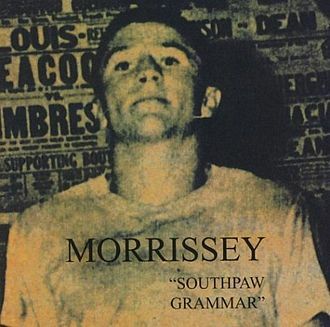 A few months later and Southpaw Grammar arrived. Now on RCA/Victor, the first of Morrissey’s nostalgic record label rejuvenations, here was a new record in every sense of the word. I was never more devoted than in 1995 and can still remember getting the record home and putting the first side on. The Teachers Are Afraid Of The Pupils is quite unlike any song ever recorded, 11 minutes of mildly jarring strings, with Morrissey siding with teachers struggling with classroom anarchy. A long way from his cathartic character assassinations of his own teachers, this felt like an older man looking at what he sees – or thinks he sees – and shuddering. Oddly, it felt in tune with my own feelings of school: the teachers are trying, and they’re alright. It’s your fellow students you’ve got to watch out for. For this song alone this album is unmissable. Follow that? Two songs that sound like singles, if not terribly strong ones. Reader Meets Author and The Boy Racer. The latter sounds tame on record but live at Ilford and Battersea Power Station (Moz lamented on stage ‘Yes I thought it would be inside the power station too’ as he sung from inside a large tent next door) it rocked very hard indeed. I don’t think The Operation was performed at either of these shows, nor at any Morrissey concert I’ve been too, which is a shame as it shows of Spencer Cobrin’s drumming in a lengthy solo, followed by another fight song, roaring along like something off Your Arsenal. The ‘you – oo-ooo’ later in the song is a classic vocal growl. Like Black-Eyed Susan, the beautiful and strange song that surfaced as a b-side to Sunny, this song is a pretty bold experimental mix. When I listen to it now I’m struck by how well it works, and can understand Morrissey’s frustration at the lack of credit Boz Boorer and Alain Whyte as songwriters. Then again, everyone else’s loss, like anything to do with Morrissey’s solo career. I do wish he’d play it live though, mainly for the mosh the end section of the song would have engineered. Some of his later solo shows would be considerably livened up by a bash at this rather than another Smiths rehash. The Operation is another long song (6.52) that doesn’t feel long. Side Two dawns with Dagenham Dave, which though not one of his best singles, has a brilliant video – especially where Dave replaces the names of ladies in his life with ‘Moz’. The video finishes with Dave himself smashing a gold disc, which looks like Vauxhall & I. You could write a book about that video alone, and the man himself looks highly dishy in it. Do Your Best And Don’t Worry is another rocker, with Alain’s backing vocals keeping things perky. It’s a bit turgid compared to other things on here but works with the album, though Moz sounds a little non-committal. I don’t really have much interest in the minutiae of Morrissey’s personal life, so The Best Friend on the Payroll’s references are lost on me but, again, the backing vocals are amazing. That it was played in concert a decade later says something about how good it is, and how lost it got in all the other stuff rumbling around Morrissey in the press at this time. In a more sensible era this song, and this album, sounds fantastic. While Speedway sounded like the end of a career as well as an album, finishing with Southpaw is something of a tease. Ten minutes of instrumental, after the vocals have warned ‘There is something that you should know, the girl of your dreams is sad and alone…’ ducks back into Strangeways territory, leaving questions hanging in the air. This album was not followed by more of the same. Or was it? Sunny, then a period of silence, then Maladjusted, with it storming title track and the brilliant Satan Rejected My Soul, but like the anaemic cover of the album there was a lot missing. This left quieter evenings to fill with visits back to the England painted by Southpaw Grammar: tough, exciting, unforgiving, but fragile. Growing up in a family with a serious Lake District obsession means that Wastwater is a near-mythical body of water. England’s deepest lake was, and is, inevitably reached after a mammoth journey, and like nowhere else signals that you’re in the nethermost of Albion’s mountain territory. Beyond here is remote Wasdale Head, and all around are great sentries of green peaks: Great Gable, Lingmell, and the two tops of the Scafell Massif. The lake itself is no mere decoration. On Friday I did something I’d been thinking about for some time. From the warm comforts of the Brackenclose, the Fell & Rock Climbing Club hut that stands sentry at the foot of the tourist track up Scafell Pike, I strolled down to the lake shore. 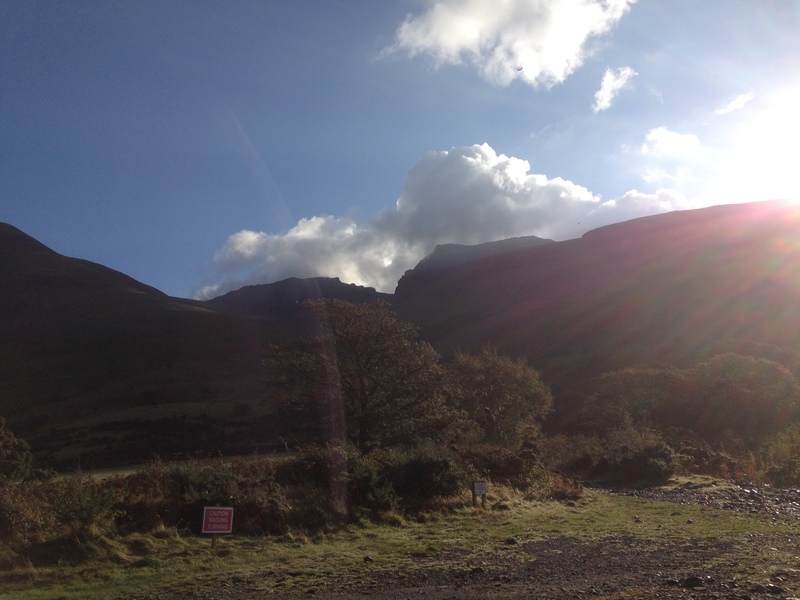 There are a choice of entries – a grassy slope over towards Wasdale Head Hall Farm, a rocky beach where the Mosedale Beck flows into the lake. I went for somewhere in between after hopping a gate which led to the water. The sun was, after an afternoon of rain, shining straight down the lake, turning a strip of the surface yellow. Swimming into the sun like this is intense and thrilling. Perhaps buoyed by the excitement, the dark water wasn’t as cold as I’d expected. Still gasp-inducing, still exhilaratingly cold, but soft, deep and lovely to splash about in. Flipping on to my back the magnificent cathedral of rock that is the Wasdale Valley came into view. I barely had to move my head to take in Yewbarrow, Great Gable, Lingmell and Scafell Pike. Turning again, I swam into the golden sun briefly, then clambered out. After two days on the hills, climbing some of the tops I’d gazed at from the water and exploring Mosedale Valley in bright sunshine, I walked down the track again on Sunday afternoon. A bright morning had passed, and the sun that had shone on the screes on the southern slopes of Illgill Head had just popped behind the now-glowering cloud. No matter. Time for another dip. This time I didn’t enter the water with anything approaching grace, more slipping on some rocks and ending up half-crawling until at swimming depth. Strange and different: the water felt much colder, more like a winter swim than the late-summer fun I’d had 48 hours before. This means you can feel yourself getting colder as you swim, and swear a lot. My father-in-law’s suggestion of fifty strokes out and back, whatever the temperature was duly completed, and I walked fast and shivering back to the Brackenclose open fire. Swimming in the Lake District is shake inducing and breathtaking: pack your trunks and join in the excitement.